Ciminelli Real Estate Corp.'s big apartment project proposal on Elmwood Avenue was a major source of controversy in the surrounding neighborhoods. But in the end, it may have been, well, just a reverie. More than than 30 months after acquiring 11 properties on Elmwood and unveiling a major redevelopment plan, the Buffalo-based firm has agreed to sell five of them – including the prominent former J.P. Bullfeathers restaurant site – to a small family-owned group that owns fewer than 40 apartments of its own around the region. That could mark the end of the Arbor + Reverie project, Ciminelli's $40 million plan to demolish the 11 existing structures and erect a pair of new condominium and apartment buildings in their place at Bidwell Parkway and Potomac Avenue. The initial project, unveiled in November 2016, would have included nearly 100 condominiums and apartments, eight retail storefronts and a three-level parking structure in the two five-story buildings. It was designed to transform that part of the neighborhood and bring in a new demographic, but was quickly denounced by neighbors as inappropriate and out-of-scale with Elmwood. Ciminelli tried to appease neighbors by suspending its demolition request, withdrawing one of the building proposals and scaling back the other to four stories. But vocal residents still fought the initiative, ultimately forcing the developer to shelve the project as it was originally conceived. It sold three apartment houses on Potomac and Ashland avenues to investors from downstate and from Watertown, allowed a new restaurant to open in another building on Elmwood, and tried unsuccessfully to win city approval to turn the Bullfeathers property into a parking lot. But the latest sale indicates that the project may have gone from limbo to abandonment, and Ciminelli is apparently now entertaining offers on the other properties. 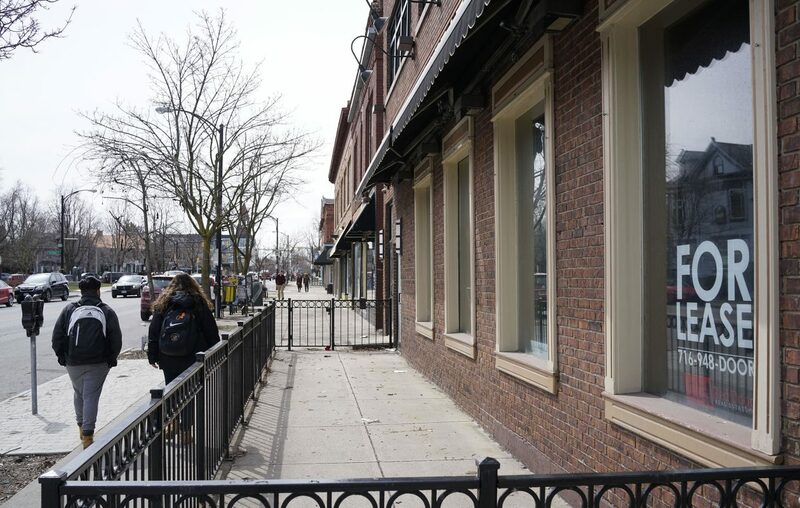 "We have had several parties express interest in the Elmwood Avenue buildings but all of the properties are still in our ownership; nothing has been finalized," said spokeswoman Anne Duggan. "While we still continue to explore and evaluate all options, there are no current development plans." Whitesand Family LP said Tuesday that it has signed a purchase agreement to acquire five buildings, but did not say how much it was paying for the properties at 1006-1008, 1010, 1020, 1024 and 1028 Elmwood. The deal is expected to close within four months, said developer and Whitesand Partner Tom Sand. The properties include Bullfeathers, a longtime former Elmwood Village restaurant at 1010 Elmwood, as well as three storefronts and more than 10 apartments. "Our plan is to lease the restaurant," Sand said. "We don't plan on making any changes to that property." The building at 1006-1008 Elmwood has two retail stores and five apartments, and Sand said they plan to "do some upgrades" to that building, but no structural changes. The other three buildings to the north of the restaurant are two-story doubles, with a single storefront at 1028 Elmwood that is occupied by a comic book store. The units are mostly occupied. Sand said the developer is considering demolishing those three houses and replacing them with a four-story mixed-use building of both apartments and retail space. He said the firm met on Monday with neighbors from surrounding block clubs and the overall Elmwood Village to discuss the proposal and seek input, but recognizes that "we'll get a lot of pushback from that, but that is what we are trying to do." Whitesand will announce more information about its plans in the coming weeks, with initial plans going before an upcoming Buffalo Zoning Board of Appeals meeting. The project would likely also come to the city Planning Board, but "we're just exploring it at this point in time," he added. He declined to estimate a total value for the projects. “We have a chance to pump new life into a sorely missed restaurant and bar space while also adding a mix of modern apartments and built-to-the-sidewalk retail," Sand said. "We’re excited about creating additional retail spaces that will enhance the shopping opportunities in the Elmwood Village and attract more people to Elmwood." Whitesand is a family partnership consisting of Sand, Don White and other relatives. The firm owns four multifamily rental properties in Buffalo, Amherst, Blasdell and North Carolina, with two more under development. In the Elmwood Village, the family owns and manages 16 luxury apartments and two studio units at 305 West Utica, and is almost finished with 297 West Utica, which will have eight new luxury apartments and another studio when it's completed. In all, it will have 39 units, prior to the Ciminelli purchase. Sand said he and his family have been "looking for some properties" to add to their portfolio, now that they're finishing up their West Utica Street project. So when a realtor approached him about the Ciminelli properties, the family seized the opportunity.